As already mentioned, please leave here your comments, issues you may have, requests for improvements, additions, etc. I'll do as much as possible to answer your requests so watch for the Dropbox area for updates. (functionally identical to the one for Android). * the app will try to automatically connect to the Extractor when it is started. A re-connection may be 'forced' by pushing the game controller button (top-right) on main screen. * the IP address of the device is reported as floating text upon pressing the 'game controller' button (top-right). The same button is used for 'checkpoints' that would reset max RPM and speed when changing cars/games. * there is Facebook integration, disabled by default so you won't get annoyed. It can be enabled via the Help ('?') screen (top-left button on main screen). Units set-up (metric/imperial) is also available there. * an option to adapt the speed and travel computation for games that report speed as m/s (games like EuroTruck) is present on the settings Help/About page. It can be enabled/disabled in the 'help/about' screen (top-left button). Be sure to disable it (set to 'off') when playing games that report speed as kph or mph (default is off). 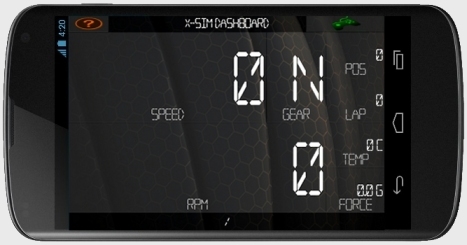 * the gauges (main screen) will turn red while driving as follows: speed text turns red when close to max speed (auto-adapted for each session based on telemetry info); rev counter text background turns red when close to max revs to assist you with gear changes (auto-adapted for each session based on telemetry info). In both cases, for this to be most efficient you should use checkpoints if driving with different cars (push game controller button (off/on) between races when changing cars). * RPM analysis is displayed divided by 10 (easier to read for whoever is interested) and is considered two-fold: for 'perfect' shift (lits green) and over-rev (lits red), still adaptive for each race/car via the checkpoint button (top-right). Off the top of my head that's all relevant for now. Last edited by thaparser on Fri 9. May 2014, 16:47, edited 6 times in total. Hello! Thanks for this great app! I've tested it with my Motorola Defy running CM10 (4.1.2). Works great with rFactor and Grid 2. With Euro Truck Simulator it seems to be a problem related to speed, the displayed speed is lower than the in-game speed. Maybe I need a physics mod. The UI doesn't fit my screen at all, the gear overlaps with the word "gear", the same happens with temperature and force. st3al wrote: Hello! Thanks for this great app! I've tested it with my Motorola Defy running CM10 (4.1.2). Works great with rFactor and Grid 2. With Euro Truck Simulator it seems to be a problem related to speed, the displayed speed is lower than the in-game speed. Maybe I need a physics mod. The UI doesn't fit my screen at all, the gear overlaps with the word "gear", the same happens with temperature and force. I'll try to find the game and check what happens there. do you use imperial or metric settings for speed (ingame and in app)? I'll get back to you as soon as I have news. st3al wrote: Works great with rFactor and Grid 2. With Euro Truck Simulator it seems to be a problem related to speed, the displayed speed is lower than the in-game speed. Maybe I need a physics mod. 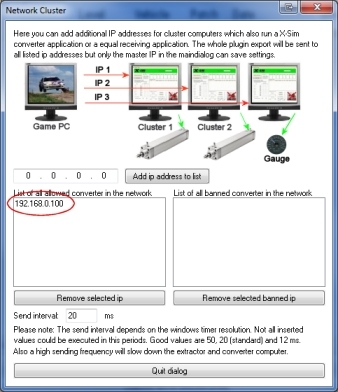 as st3al mentioned earlier and provided the reference information, the game exports speed gauges information in m/s (confirmed here: https://github.com/nlhans/ets2-sdk-plugin also confirmed while testing the game with the x-sim converter using the recommended plugin). LFS and other games report user friendly/readable information for gauge/dashboard data (e.g. km/h values). however, if there are many more games that need this conversion let me know. otherwise it seems that this game needs its own plugin for proper dashboard/telemetry data. Is this a game problem or do the plugin output the wrong value on every compatible game? sirnoname wrote: Is this a game problem or do the plugin output the wrong value on every compatible game? for the moment I'd say it is a game problem as the same plugin is used with rFactor with no issues (per info from st3al earlier). also, the SDK states clearly that speed information is provided as m/s instead of km/h. I've added an option to adapt the speed and travel computation for games that report speed as m/s (games like EuroTruck). It can be enabled/disabled in the 'help/about' screen (top-left button). Be sure to disable it (set to 'off') when playing games that report speed as kph or mph (default is off). Note that on this 'beta' release, the IP address of the device is reported as floating text upon pressing the 'game controller' button (top-right). The same button is used for 'checkpoints' that would reset max RPM and speed when changing cars/games but now you only need to press it once. The app will connect to the Extractor automatically upon starting. A re-connection can be done at any time using the 'game controller' button (top-right). Fixed UI scramble on certain occasions now as data checks are in place. thaparser wrote: I've added an option to adapt the speed and travel computation for games that report speed as m/s (games like EuroTruck). It can be enabled/disabled in the 'help/about' screen (top-left button). Be sure to disable it (set to 'off') when playing games that report speed as kph or mph (default is off). Note that from this release onward, the IP address of the device is reported as floating text upon pressing the 'game controller' button (top-right).